Met the nicest lady named Diane the other day at the Edmond Farmer's Market. She's living a gardener's dream. She grows all these pretty flowers and sells them in vintage and reclaimed containers. They are pretty. I admire anyone who is able to live their dream. I guess school will start soon. Enjoy youru weekend. So pretty - especially the sunflower! What a great dream she is living! Your flowers are pretty and I love the glass jar. Oh how I would LOVE to do that, or just buy some too!! :) Thanks for sharing! What a gorgeous sunflower! Lucky lady living out her dreams, what she is doing is a dream! Thanks for sharing and have a great day Stacey! So pretty. I love the idea that she is selling her flowers And finding a beautiful way to re-use containers. Clever, practical, and pretty! They are wonderful! What a beautiful sunflower! Oh so pretty...I've been wanting to go to the market for some Stratford peaches! How cute those flowers are in a mason jar! So beautiful! I love the blue jar...darling! Friday blessings to you too;)! Lovely! The jar is too! I love them too! You can't beat an old jar for any kind of bouquet. Pretty flowers, old jar....my kind of happy! Thanks you for your kind words you left for me. It was a tough week. I finished the bag of M&Ms Friday morning while I was reading everyone's comments. The blogging community is very supportive. Thanks for that. I agree, Diane is living a gardener's dream. Those flowers are beautiful. Have a terrific weekend. Don't you just love to find talent like this, especially when it is in a town close by? Very simple and pretty. 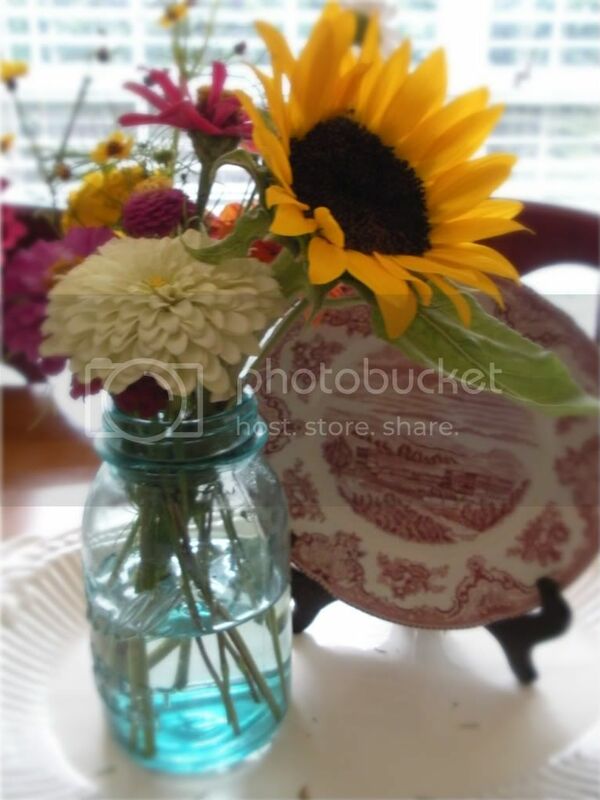 The flowers look just perfect in that jar and I love the plate too! I loved seeing what you saw on the tour. Thanks for sharing that & thanks for the new word "
Forgot to say "I ♥ ♥ ♥ YOUR HEADER!!!!!" I'm going over to Shabby Creations to check them out right now!! Love the lady you spoke of! She IS living her dream. Amen! What a dream she is living!! So pretty!!! So pretty. Wish we had a farmers market here. So gorgeous....such a welcoming sight. Stacey, could you do me a favor please? Andrea from Opulent Cottage just signed up for the Rooster Party (said she was coming from your blog) but didn't leave any blog address. Could you have her contact me...I would surely appreciate it. The count down to school it here!! Are you getting excited yet? ?